Fights dark circles & de-puffs. Put puffiness to bed and wake up to a rested look. A hydrating and refreshing eye gel cream infused with Essential Oil, Hyaluronic Acid and Caffeine. It helps fight signs of fatigue and reduce the appearance of dark circles and puffiness for a fresh, bright look. Apply every night to the under-eye area, starting from the inner corner and moving outward. Gently blend in until product is fully absorbed. Use nightly with Garnier SkinActive Miracle Anti-Fatigue Sleeping Cream. AQUA/WATER, DIPROPYLENE GLYCOL, DIMETHICONE, GLYCERIN, ALCOHOL DENAT, BIS-PEG-18 METHYL ETHER DIMETHYL SILANE, VINYL DIMETHICONE/METHICONE SILSESQUIOXANE CROSSPOLYMER, DIMETHICONE CROSSPOLYMER, PEG/PPG/POLYBUTYLENE GLYCOL-8/5/3 LYCERIN, HYDROXYETHYLPIPERAZINE ETHANE SULFONIC ACID, ADENOSINE ALBIZIA JULIBRISSIN BARK EXTRACT, ALUMINUM STARCH OCTENYLSUCCINATE, AMMONIUM POLYACRYLD IMETHYLTAURAMIDE/AMMONIUM POLYACRYLOYLDIMETHYL TAURATE, CAFFEINE, CAPRYLYL GLYCOL, CARBOMER, CI 16035/RED 40, CI 19140/YELLOW 5, DARUTOSIDE, LAVANDULA HYBRIDA OIL, PHENOXYETHANOL, PPG-3 MYRISTYL ETHER, SILICA, SODIUM ACRYLATES CROSSPOLYMER-2, SODIUM HYALURONATE, SODIUM POLYACRYLATE, TRIETHANOLAMINE, XANTHAN GUM. 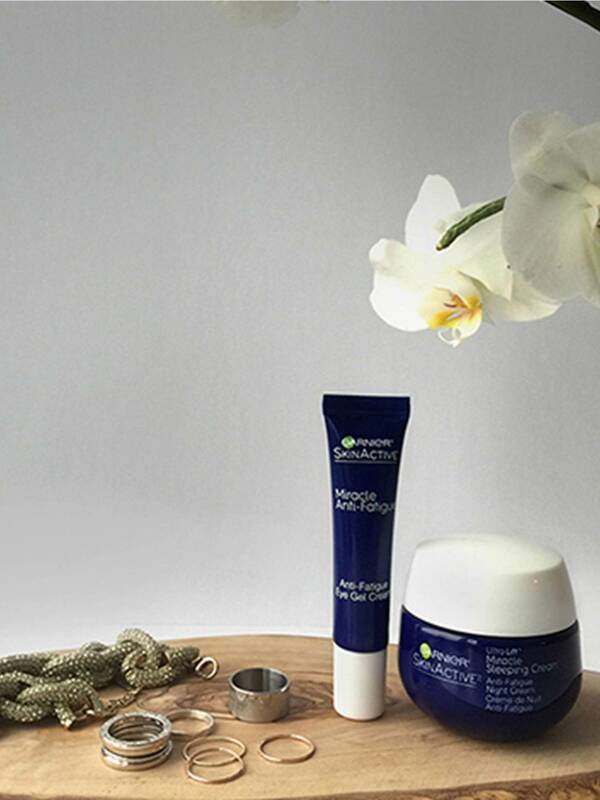 Rated 5 out of 5 by NikkiF87 from Mind Blowing Miracle Sleep Eye Cream! I recently received a free sample of Garniers Ultra Lift Miracle Sleeping Cream for Your Eyes, I'v only recently gotten in to nighttime skin care so I'm glad that I have this Miracle Sleep Cream for Eyes to be one of the first products I use for nighttime, this cream is remarkable! It goes on light an gentle, it's not greasy, it absorbs quickly in to your skin under your eyes, it feels refreshing an slightly cooling! It has an amber color but goes on clear, it has a nice scent you can hardly smell it though. After I applied this to my under eyes I went to bed, when I woke up in the morning I saw visible instant results! My under eyes were far less puffy an it appeared that my dark circles were lighter an more skin toned! My eyes looked refreshed an vibrant! My face looked gorgeous! As I stared at myself in the mirror I was in disbelief! I'm still in shock when I wake up each day an clearly see the difference in my skin! I'm very satisfied an amazed by this Sleep Cream! I definitely recommend this, the benefits an results are instant and fabulous! This has been a huge confidence boost! Thank you Garnier you all are the best! I love all your products! #garniergirl for life! Rated 5 out of 5 by Creative one from The best eye gel cream I used This stuff works good. It helps my eye bags, & I think it helps with my dark circles too. It makes my eyes look well rested. Thank you, Garnier. Please don't discontinue this. Rated 5 out of 5 by Tatis1998 from Fantastic, No More Scary Eyes in the Morning I was recommended this gel by a worker at CVS and while I was not sure about the results, I bought it along with the sleeping cream. 4 days later and my eyes look much better. I no longer have a scary look in the mornings! Thank you Garnier! Rated 5 out of 5 by Mchriste from Best I've found By far the most effective affordable product I've found for combating puffiness and dark circles. Rated 5 out of 5 by AlyAnne from The Eyes Have It! After love, love, loving the Miracle Wake-Up Cream and Anti-Fatigue Night Cream, I searched for this eye cream and am not disappointed! It too is a miracle worker ~ my eyes feel and look brighter, the skin around my eyes appears healthier, and my crows feet are disappearing. And all it takes is the tiniest of drops! Rated 4 out of 5 by Anonymous from I love how this eye gel hydrated and refreshed my eyes. I felt that my eyes were plumper & had fewer wrinkles. Rated 5 out of 5 by Anonymous from Found my new favorite go-to night cream. I love this stuff. It does what it says, even after once use I noticed a differance. No more dark circles or bags under my eyes. It goes in smooth and doesn't leave a oily feeling. 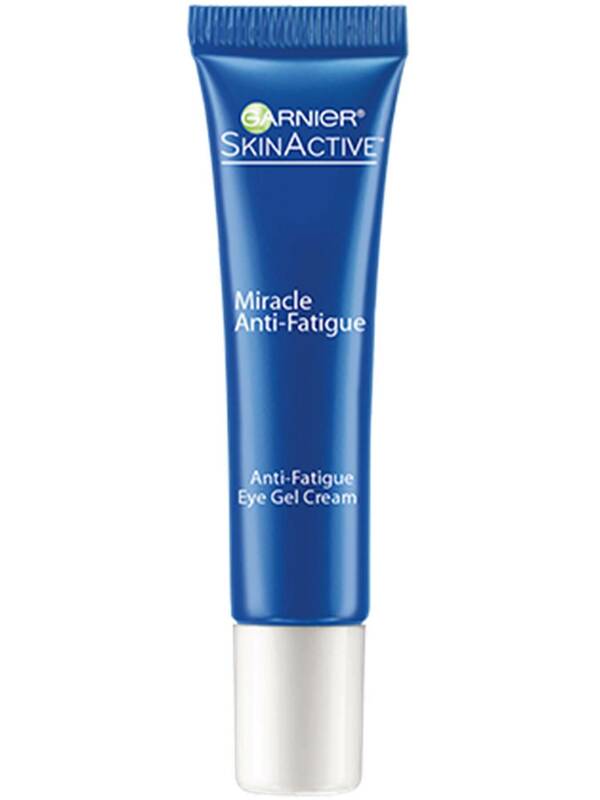 Rated 5 out of 5 by ColleenB from My eyes have been looking very tired lately, but since starting to use garnier skinactive miracle anti-fatigue eye gel cream has really helped them to look much younger. I was having to use a lot of makeup to make my eyes look good, but now I am back to no makeup most days.